After yesterday’s cynical attempts by Theresa May to buy the votes of a small number of Labour MPs by making hollow promises on employment rights the Hazards Campaign has published its manifesto for health and safety. 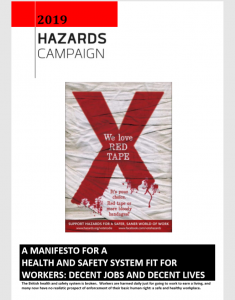 B) a manifesto developed by people who actually care; Hazards activists and trade union health and safety reps who have first hand experience of the health and safety carnage of conservatism. We are putting our money on B not surprisingly and will be posting a number of articles covering this important manifesto in the coming weeks. Please get this on the agenda for your trade union branch meeting, get your union to support the manifesto and join with the Hazards Campaign to reclaim health and safety for workers, send it to your MP (including Tories but don’t hold your breath for responses) and seek their support for the manifesto.